Renewable, Reliable, and Abundant Wind Energy — The Future is Here and Now! Imagine, if you will, a nation powered by a renewable, reliable, abundant, and virtually silent source of fuel that can be converted readily and efficiently to supply an ever-increasing demand for electricity. Imagine a source of fuel that will lessen the demands for fossil fuels, the threat of depleting the ozone and the global concern over ever-increasing carbon footprints. Not to mention a source of fuel that produces no pollution and is projected to save 4 trillion gallons of water in the U.S. alone by the year 2030. “Kryptonite?” you ask. Not quite, the source is here in our galaxy and right in our own backyards. This source of fuel has been a constant companion to man and has been around in vast supply since before the time of the pyramids, cooling us down as the days end and on hot summer nights, and causing the mighty eagle to soar; it is the wind. The technology for harnessing the wind and converting it to clean quiet energy in abundance is here now and here to stay; no longer is it what many have believed to be something that the future holds in store when, or if, current technology can be developed to harness it. In this article, the reader will take a look at the history of harnessing the wind for production of electricity, what its impact is currently, and how this renewable resource has been quickly shaping our future of late. We will also look at the new Article 694 in the 2011National Electrical Codeand at how theNEChas risen to the challenge of addressing this newly improved technology and at the growing use ofsmall wind (turbine) electric systemsin single- and multi-family dwellings. Photo 1. Several of today’s modern wind-produced generating facilities are implementing new and innovative ways of capturing even the slightest breeze to generate electricity. 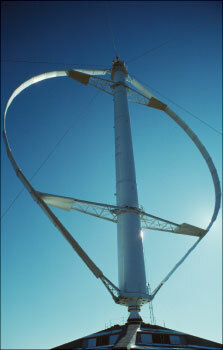 Although wind energy, much like photovoltaics (solar energy), started to make its appearance back in the 1970s as an alternative renewable energy source, fossil fuel had already been crowned the king and many markets and industry itself, here in the United States and around the globe, were built around it. These industries and markets not only rely on the supply of fossil fuel, but many of the modern conveniences that we daily rely on depend on the supply of these fuels, modern plastics being just one of the many industries. Even today many modern modes of transportation, whether it be the automobile, airplane, bus or train, and most forms of public transportation are heavily reliant on fossil fuels; although we are now beginning to turn the corner, and are seeing many forms of transportation including many public means of transportation that are converting to electric power. With this rapid change on the forefront, the growing demand for electricity will surely increase exponentially, and harnessing the wind will help to secure an abundant, renewable, and highly reliable source of electricity now and in the future. Photo 2. Many years of engineering and research have now shown us that large towers and variable pitch blades are necessary to reach up and capture the wind where it is likely to be constant and measurable. Photo 3. 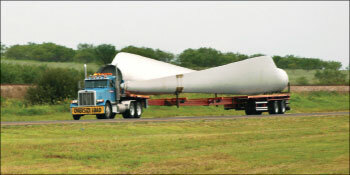 The reader can see the size and the shear enormity of a portion of the tower section of a modern wind-driven generator by simply comparing it to the flag truck that will accompany it to its final destination. Currently around 25% of all wind production facilities are utility owned with many of these facilities being either community owned or part of a cooperative energy producing facility supplying many cities and towns.5 A major benefit is that once a wind farm is installed the electricity generated is inflation-proof and can provide long-term benefits over fuel pricing volatility, something that as a consumer each and every one of us has experienced over the years. With 42% of all new facilities generating electricity being wind, the production of wind farms has been second only to natural gas for the fourth year in a row. Photo 4. 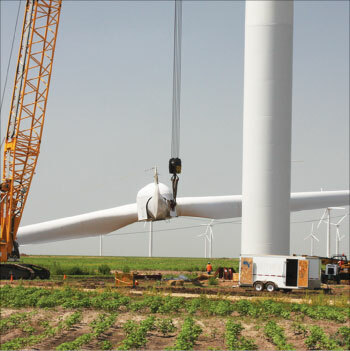 With these mammoth electricity-producing giants becoming almost commonplace in today’s modern wind farms, installers have all but perfected the methods of erecting them, which cuts down on the time it takes to put them into production. Photo by Randy Hunter. As we look at some of theNECrequirements of these systems, the first thing we are made aware of by the scope of Article 694 is that this article applies to “small wind (turbine) electric systems” and provides installation and inspection requirements for systems up to and including 100 kW. Informational notes which have been renamed as such from the previous fine print notes inNEC-2008 tell us that these “small wind (turbine) electric systems” can be “interactive systems” or “stand-alone systems” much like the photovoltaic systems described in Article 690. Many of these systems are utility interactive, some are currently being used to augment existing photovoltaic systems and many are stand-alone systems. Many of these systems include battery storage for the excess energy produced for future use or for use when periods of no wind are experienced. Of note to the reader, these systems, whether they be interactive or stand-alone, is that 694.2 indicates that therated power(see definition of rated power in 694.2, Definitions) output of these small wind (turbine) electric systems is generally measured at a wind speed of 11.0 m/s (or 26.4 mph). If a system contains a turbine that produces more power at a lower wind speed, the rated power would then be measured at a wind speed less than 11 m/s that produces the greatest output power. This method for measuring wind turbine power output, or rated power is extracted from the IEC Standard 61400-12-1, Power Performance Measurements of Electricity Producing Wind Turbines. Also note that themaximum output power(see definition ofrated powerin 694.2, Definitions) is identified in 694.2 as “The maximum one-minute average power output a wind turbine would produce during normal steady-state operation (instantaneous power output could actually be higher in some cases). Photo 5. As the modern wind farms are becoming more and more prevalent, the old pump jack platforms that once covered the landscape of many oil production and natural gas facilities are continuing to vanish, giving way to renewable, reliable and abundant wind energy! It’s also important to note that when sizing these systems for ampacity of the conductors and the overcurrent protective device ratings, the current derived from the small wind electric system is considered to be continuous as indicated in 694.8(B)(1), much like a photovoltaic system. Circuit conductors and overcurrent devices are required to be sized to carry not less than 125 percent of the maximum currents as calculated in 694.8(A). The rating or setting of overcurrent devices is permitted in accordance with 240.4(B) and (C). As we look at Part III of the new Article 694, we see the requirements for disconnecting means of the small wind electric system that are located in 694.13 which tell us that a means to disconnect all of the current-carrying conductors from the small wind electric system from all of the other conductors in a building or other structure is necessary. Section 694.13 also indicates that a switch, circuit breaker, or other device, either ac or dc, is not be installed in a grounded conductor if the operation of that switch, circuit breaker, or other device leaves the marked, grounded conductor in an ungrounded and energized state. Note the exception to 694.13, that indicates that a wind turbine that incorporates and uses a turbine output circuit for regulating does not require a disconnecting means for the output circuit. Also note that additional requirements for disconnecting means are located in 694.14(A) through (D), along with requirements for disconnecting the equipment associated with the small wind electric system located at 694.15. Part IV of Article 694 lays out the requirements for the wiring methods of these new small wind electric system. Section 694.31(A) allows the use of any wiring method located in theNECas well as those wiring methods that are specifically listed for use with these systems, with the stipulation that turbine output circuits operating at maximum voltages that exceed 30 volts need to be installed in readily accessible locations. These circuit conductors are required to be installed in raceways. Also note that the grounding of these systems as indicated in 694.43(A) for exposed non-current-carrying parts is required to be done in accordance with Section 250.134.These metal parts, like turbine blades as well as tails, are not required to be grounded as they typically have no source that might energize them. When a structure or building has a stand-alone system that is not connected to a utility service source, 694.56(A) requires a permanent plaque or directory to be installed on the exterior of the building or structure at a readily visible location, indicating this as well as the location of the disconnecting means if applicable. If a facility employs both utility service and a small wind electric system, 694.56(B) requires a permanent plaque or a directory that provides the location of the service disconnecting means and the small wind electric system disconnecting means. As we near the end of Article 694, let’s look at a couple of items of interest. Most people that own or employ small wind electric systems add a storage component to the systems, usually in the form of storage batteries. This precious energy being generated can also be stored for use at a later date, minimizing the cost of utility-provided electricity and also helping to recoup the initial investment into the system. Section 694.71 in Part VIIII of Article 694 tells us that if this type of storage system is to be utilized, it would need to be installed perNEC480. Should the system generate voltages in excess of 600 volts dc, then it would need to adhere to the requirements inNEC490 and other applicable provisions that would need to be adhered to for installations rated over 600 volts. We have visited the history of one of the oldest renewable and reliable new fuel sources of the twenty-first century and have taken a look at what is happening across the nation currently with regard to our newest old friend. We have seen how theNECcontinues to boldly go where others will not, and how it guides us with installation and inspection requirements to ensure that this new technology will be a viable long-term benefit to quench our growing thirst for electricity that is produced cleanly and affordably. Will we finally see a time where fossil fuel is no longer king and the sounds of the internal combustion engine are silenced for all time? Will our children’s children see a world where the only sound in the air is that of the air passing through statuesque towers that generate more energy than this nation and our global neighbors can possibly use? This and many other renewable energy producing technologies leave us with the question that we may never answer, at least in our lifetime. So I ask you,What will we see next…blowing in the wind? Is Electrical Plan Review Really Needed? Large Hydrokinetic Turbine Generation Is Here!